Stay dry and comfortable during runs with the sweat-wicking technology woven into this Dry Element 1/2 Zip Running Top which comes in Black from Nike. 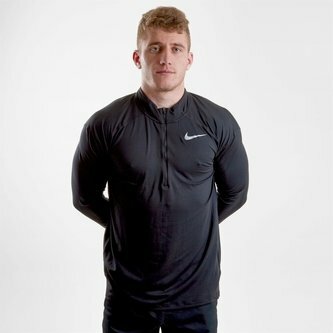 This mens running top from Nike is designed to provide lightweight comfort whilst keeping you sweat-free by wicking the moisture away from the skin onto the surface of the fabric before it quickly evaporates. Another key feature is the half-length zip which allows you to adjust the coverage from the elements as well as being able to quickly pull it on and off.